The best ways to organize cosmetics for travel involve getting your items from point A to point B without any damage. There is nothing I dislike more then traveling a long distance to find my compact is in pieces. I never have the time to run to the store to get another one. Especially if I purchase my makeup from specialty stores. Let’s talk today about some of my favorite ways to pack and organize cosmetics for a vacation or business trip. All travel cosmetic organizers are not the same. I’ve tried several different ways to pack my toiletries when traveling and I find the below products some of the best. You can easily purchase the items before your next trip with the product links below. Scroll down for more travel and packing tips from family outings to a Disney packing list printable. 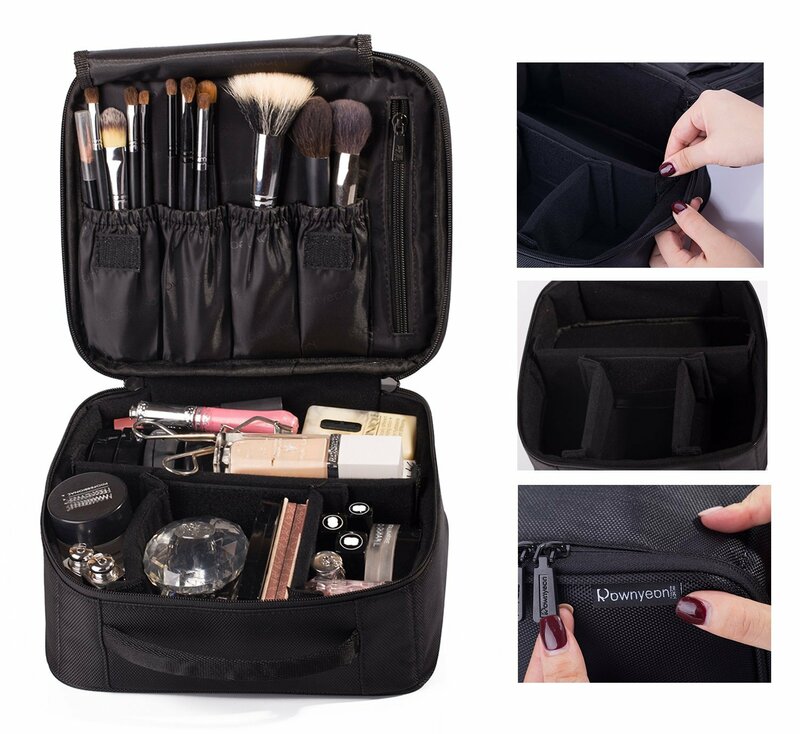 If you have enough room for both brushes and makeup, I recommend a travel cosmetic bag organizer that suits both. This way you can easily store your items and keep things off the hotel bathroom counter tops. This makes it easier for housekeeping to work around your items while cleaning. Having a good cosmetic bag that offers Velcro compartments is helpful. 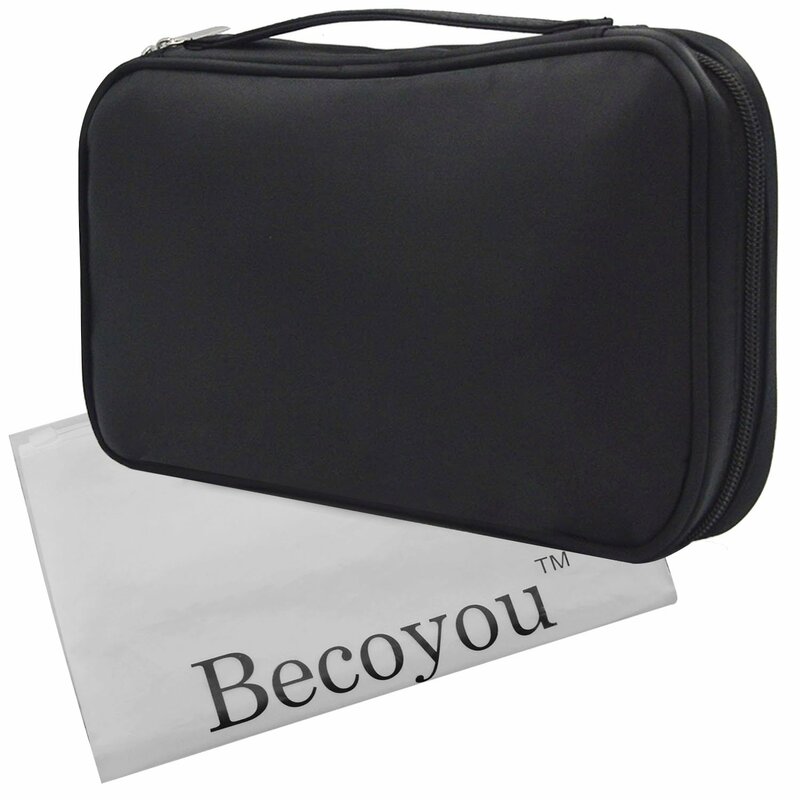 This way you can personalize the size of the compartments as you would in your own cosmetic case at home. I don’t know about you, but I’m a stickler for having my eye makeup, face makeup, etc. in separate compartments. A barrel cosmetic bag can be a nifty way to pack. 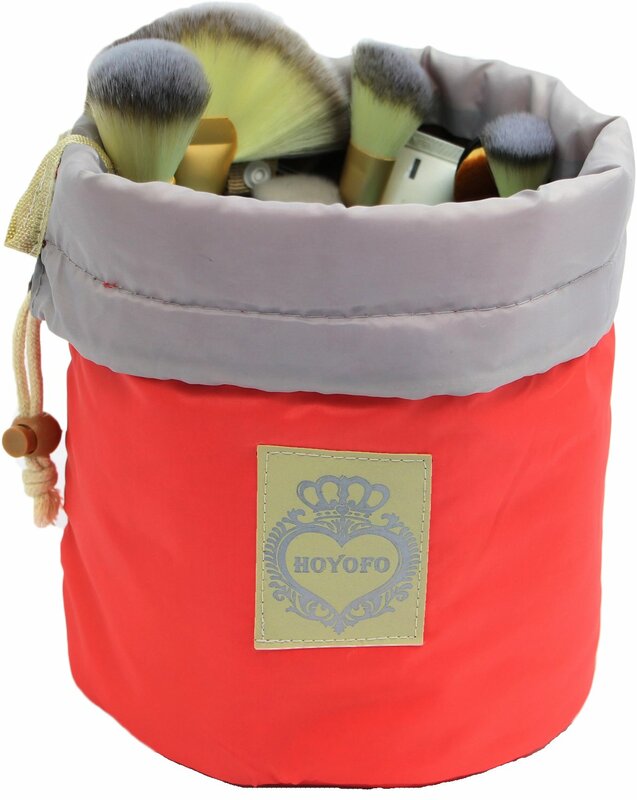 You can easily toss in your brushes and makeup to pull the bag into a duffel. If you’re not worried about having everything in a compartment, this can be a simple way to travel with your items. It might even save you some space in your luggage. Sometimes I like to separate my makeup brushes from the rest of my cosmetics. I find that if I’m traveling with only carry-on luggage, I prefer this way of packing so my brushes do not become misshaped. I recommend finding a brush case that offers room for both larger foundation brushes and smaller eye makeup brushes. You want to ensure there is enough room between each. Don’t forget that with carry-on luggage, you must use TSA approved bottles under 3.3oz in a clear gallon storage bag. This makes it tough to carry-on most standard size bottles of face wash, toner, etc. 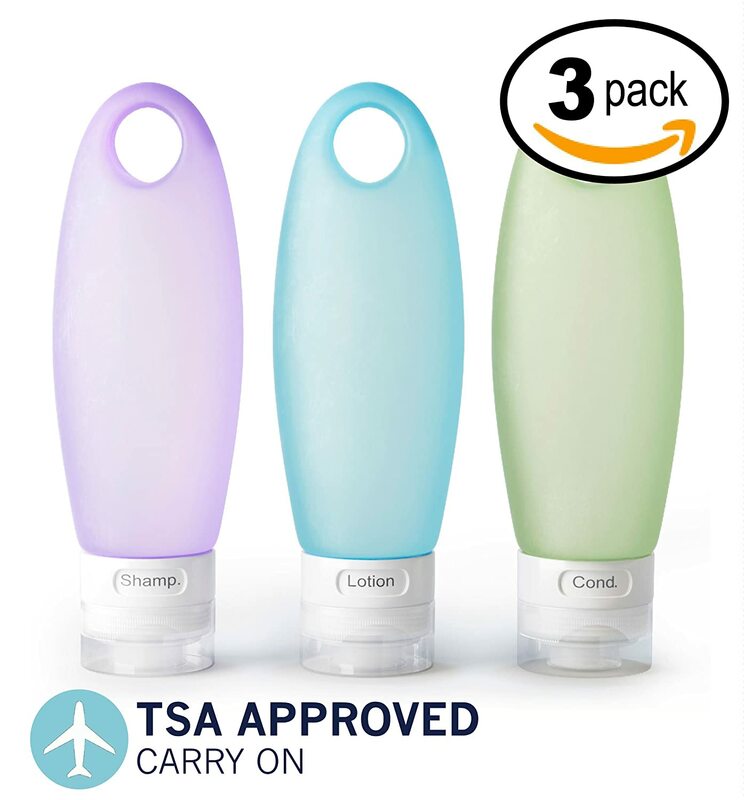 Purchase these leak proof cosmetic bottles to store your liquids during travel. This way you don’t have to go on a hunt for travel sizes of each of your favorite cleansers and lotions. Unscrew the top of your toiletry items and use a small piece of saran wrap over the top before replacing the lid. So long as the lid fits snug when placing it back over the plastic, this will help keep liquids from leaking. You might also want to tape the top of the lid to the bottle. Try packing your travel cosmetic bag organizer in the middle of your luggage. By having clothing around it, you will add extra padding. Be sure to pack the case upright. While you will be tilting your luggage before check-in or boarding, majority of travel your case will be flat. I hope these tips and best travel cosmetic organizer ideas will give you some peace of mind when getting ready for your next outing or trip. Happy travels! I’m Krystal Chiarolla. Mother of a 7-year-old daughter and 5-year-old son. My husband is my biggest cheerleader in all aspects of life. 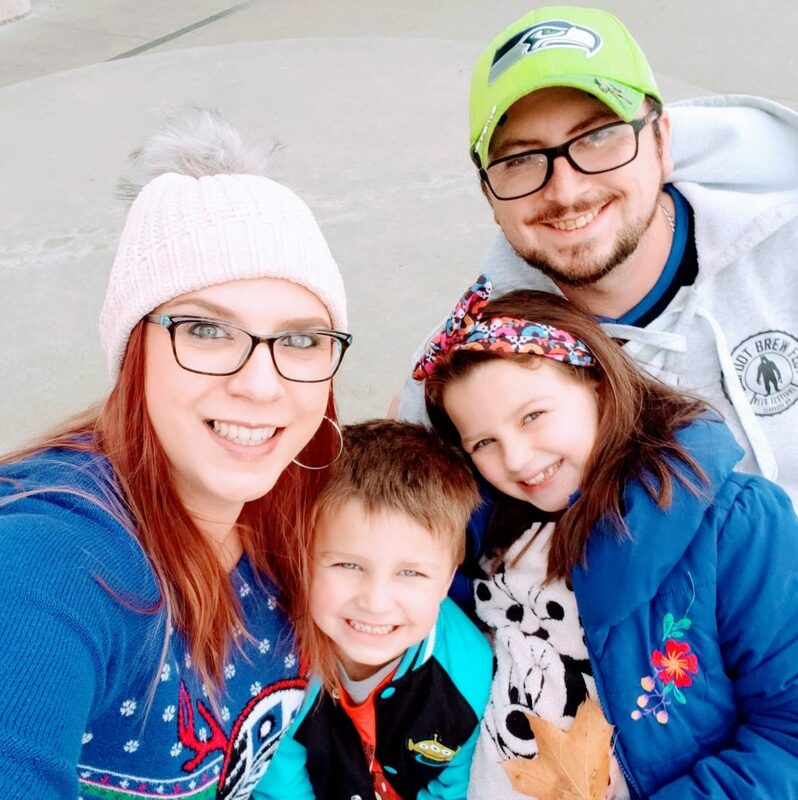 My family and I live in the Seattle/Tacoma metro area of Washington State. I have always had a passion for entertaining, travel, and making my way through life dancing. Posts may contain affiliate links. Should you purchase an item via one of these links, I will receive a commission at no cost to you. Thank you for continued support of this website.